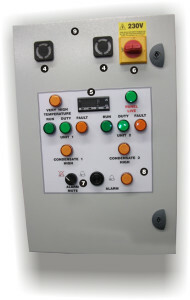 Sarum manufactures and supplies bespoke control panels to suit your individual requirements and specifications. Our HVAC system engineers work with specifications from consultants in a broad range of building types and industries and our control panels can be made to fit multiple air conditioning units. 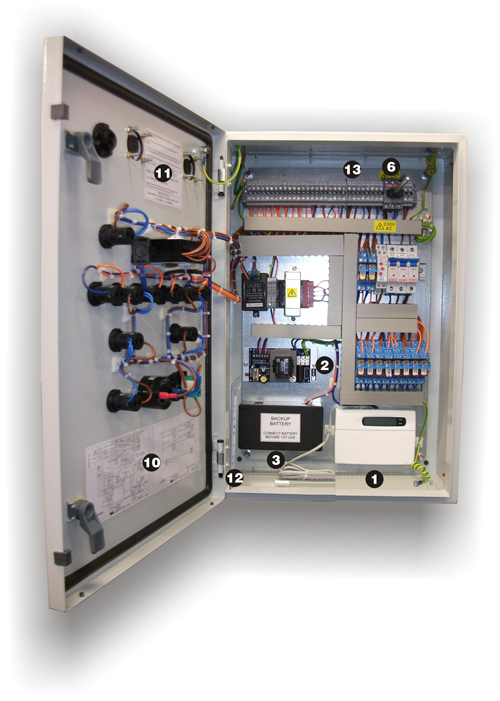 This panel was created to control two air conditioning units on a duty share basis with a high condensate alarm for each system. The air conditioning units were designed to run for 100 hours before switching to the second unit. If the room temperature was to reach the first pre-set point on the digital stat then the second unit would be enabled thus allowing both units to run simultaneously. If the temperature continued to rise and reached the second pre-set point, the ‘very high temperature’ lamp would illuminate, the alarm would sound –although this can be muted – and the auto dialler would send a message to the pre-programmed number(s). The accompanying auto dialler was for a land line and is capable of sending voice messages. We also offer a text message version that sends messages using a SIM card.The Sarum control panel has the ability to monitor fault contacts on each unit. If the duty unit went into a fault condition, that unit’s fault lamp would illuminate, the alarm would sound and a message would be sent from the auto dialler. When a fault is detected, the standby unit will be switched on. The condensate alarm works in a similar way. In this instance the air conditioning controller was designed to be linked with the building’s fire alarm system so that when the alarm was activated, the panel would automatically shut the systems down. The control panel was supplied with a circuit diagram attached to the inside of the panel door, along with a circuit diagram and o & m manual provided loose inside the panel. Auto dialler landline version (sim card version also available). Power supply for auto dialler. Battery back up for auto dialler. Control panel vents, to prevent build up of gasses given off by batteries when charging. Digital thermostat for high temperature alarm. Audible alarm with mute switch. Have a question about Sarum Air Conditioning Controllers? Please fill out the form below and we will get back to you.